QANTAS has recently gifted a B747-400 (Jumbo) to the Historic Aircraft Restoration Society (HARS) which is based at the Illawarra Regional Airport (Wollongong) YWOL. The airplane is to be flown from Sydney to Wollongong at sometime between the 7 – 13 March 2015 with the most likely date being the 7th March; weather permitting. 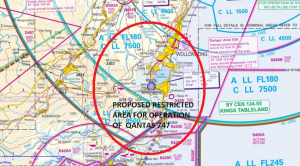 In order for this flight to take place, a temporary restricted area (TRA) will be put in place around the Illawarra Regional Airport and it is currently expected that the TRA will cover a 15 Nm radius up to 5000 ft. The planed flight of the B747 into the Illawarra Regional Airport is now scheduled for Sunday 8 March 2015. The airspace out to 8 Nm and up to 4500 feet AMSL will be closed for the arrival of the aircraft between 0730 – 0830 hrs. A NOTAM will be issued over the next few days. 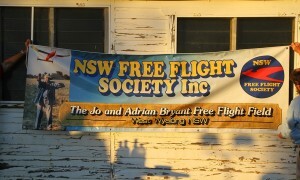 Australia’s first free flight field and a Hall of Fame award marked the opening of the West Wyalong Free Flight Field, read more in a report from Malcolm Campbell.